That “US Constitution” up there is not supposed to be there. D’oh! money isn’t backed by gold anymore though right? WTF??? Us currency backed in gold? Welcome to the 21st century, man, US currency is backed in faith and debt. It is one of the single greatest con jobs in the history of the world. The US dollar is backed by the power of Imaginaaatioooon, Imaginaayaaayatiooon . . . These bills were never publicly circulated (bank to bank only)… and they are, in fact, not legal to own anymore. 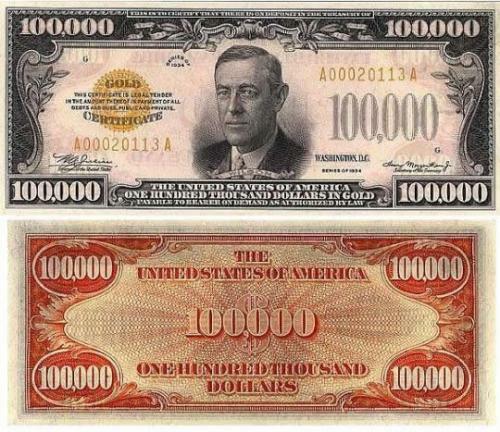 The US government recalled all bills over $100 back in the 1970s due to counterfeiting concerns. If you watch old reruns of Let’s Make a Deal on GSN, though, you can see them give away $500 and $1000 bills fairly often, but those were from the late 1960s/early 70s.